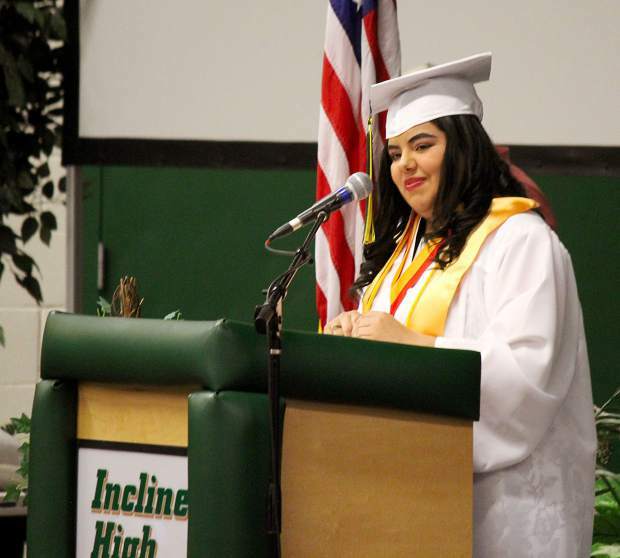 Incline outgoing senior president Adrian Banuelos-Alaniz led the graduates in turning their tassles from the right to the left side of their caps symbolizing their next step in life. 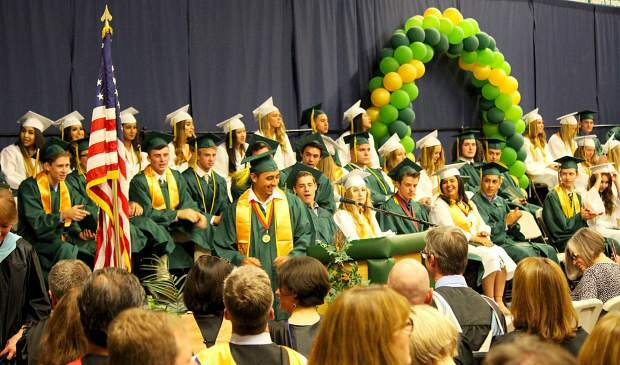 The gymnasium at Incline High School was packed Wednesday, June 13, for the graduation ceremony. 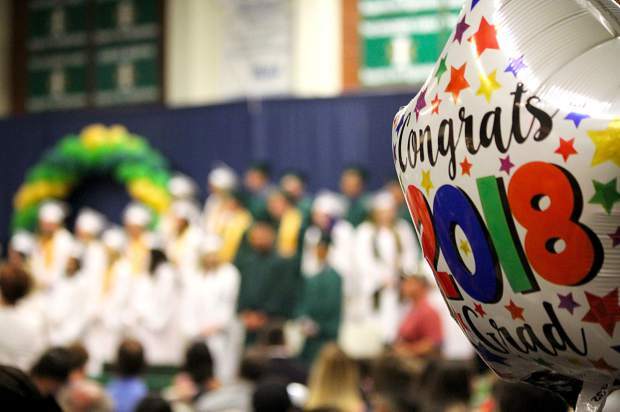 Incline High School graduated its 2018 class Wednesday, June 13, in the gymnasium. 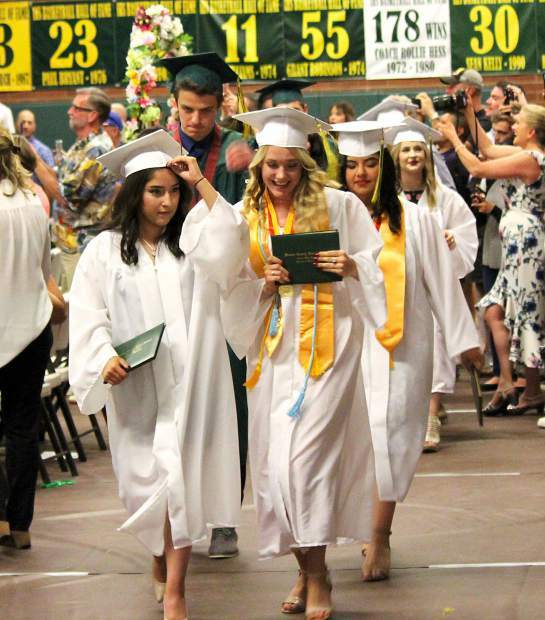 Incline High School's 2018 graduates leave the gymnasium after the ceremony. 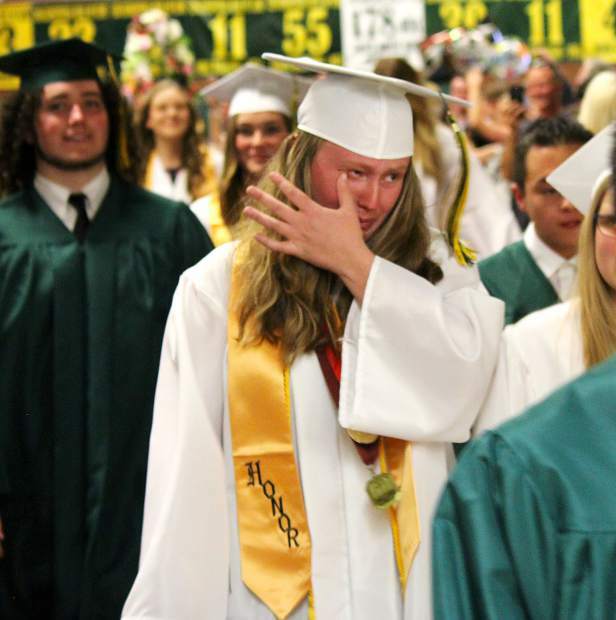 Laughter, cheers and tears were all shared between classmates Wednesday, June 13, at Incline High School's graduation ceremony. 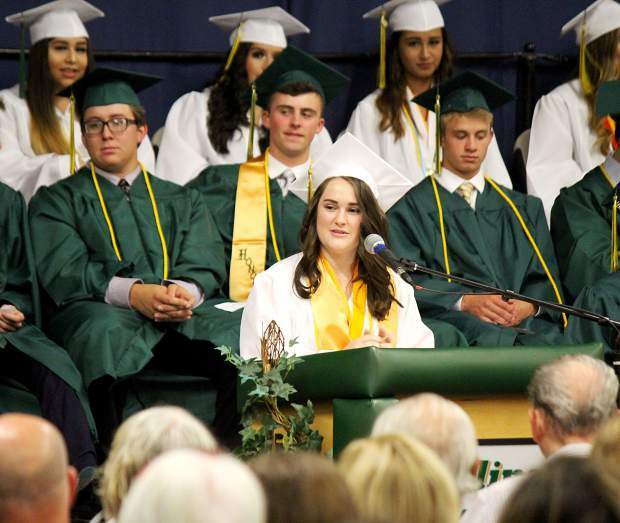 Incline salutatorian Rachael Homola speaks during graduation. Incline class of 2018 vice president Mitzy Cruz introduces the faculty, board memebrs and special guests. 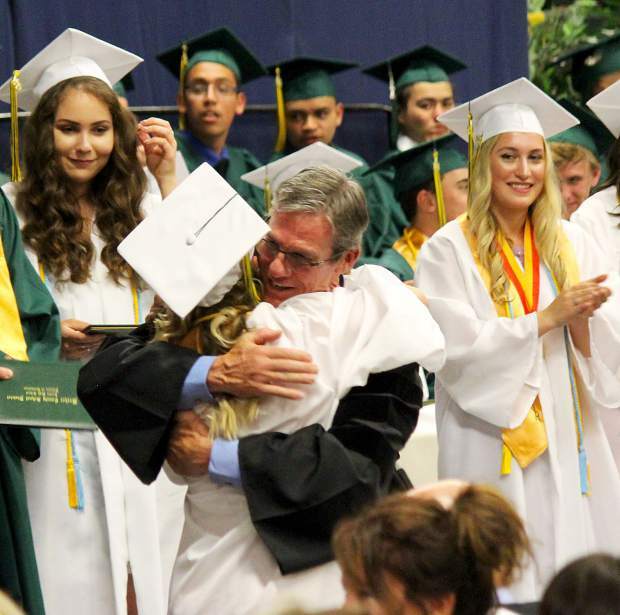 Incline principal Dr. Andrew Yoxsimer hugs a student during the diploma ceremony. 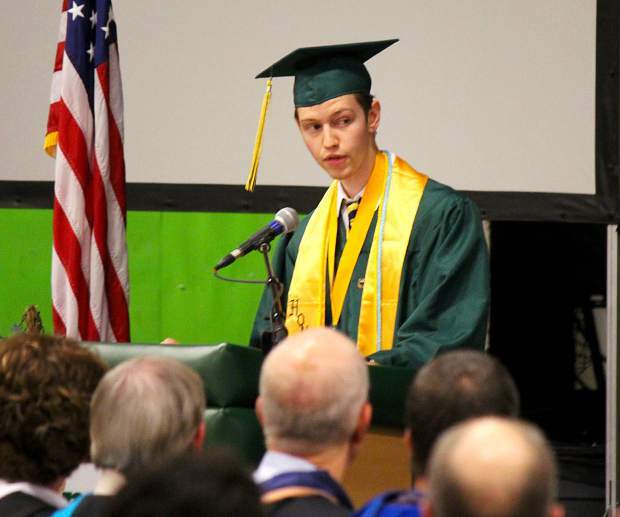 Incline's 2018 Valedictorian Colin Drewes speaks during graduation. There was standing room only Wednesday afternoon inside the Incline High School gymnasium. Hundreds completely filled the building in celebration of the school’s 2018 graduating class. Sixty-one students were honored with family and friends cheering enthusiastically throughout the 49th annual commencement exercises. 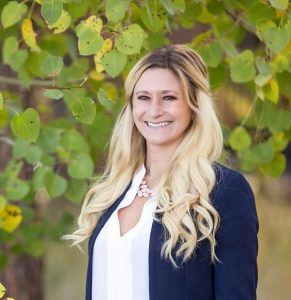 Some students were filled with excitement and some were emotional to have finished their four years at Nevada’s top-ranked public high school and third ranked overall, according to principal Andrew Yoxsimer. The graduates entered the gymnasium to “Pomp and Circumstance” performed by the school’s band, conducted by Todd Holway. Kayla Smothers belted out an energetic rendition of “The Star Spangled Banner” and was followed by student body president Madio Wallner and vice president Mitzy Cruz giving quick speeches and introducing the faculty, board members and special guests. Incline assistant principal Kari Michael announced the special awards. Colin Drewes was named the class’ valedictorian and Rachael Homola was salutatorian and both had grade point averages in the stratosphere. Drewes graduated with a lofty 5.31 weighted GPA and Homola finished her four years with a weighted 5.25 GPA. Max Wilderman won the Targe Award, which is voted on annually by the entire faculty and goes to the student who possesses the highest character and integrity. Outgoing class of 2018 president Adrian Banuelos-Alaniz was introduced and led his classmates in moving their tassels from the right side of their caps, to the left, symbolizing their next steps in life, he said. The graduates then tossed their caps into the air and walked two-by-two out of the gymnasium into a reception in the school’s courtyard. The class flower was a white hydrangea and the class song was “Gold Old Days” by Macklemore. The athletes of the year were Kate Rye and Esten Flores.